Cider vinegar, specifically, apple cider vinegar, has a long history of use in folk medicine for various health benefits such as weight loss. While many of the uses lack clinical support, some clinical studies support cider vinegar's ability to boost weight loss. The primary component of all vinegar is acetic acid, which is partially responsible in the benefits, so you don't have to limit yourself to cider vinegar for weight-loss benefits. 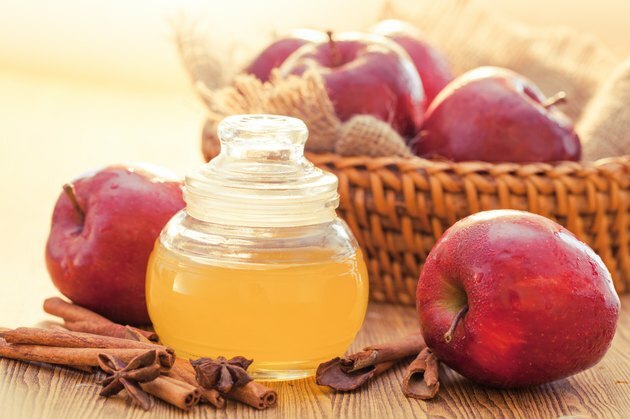 Consult your physician before supplementing cider vinegar for weight loss. Cider vinegar may enhance weight loss by preventing blood sugar spikes and boosting satiety. Consuming 2 teaspoons of apple cider vinegar prior to eating a meal of bagel and juice effectively lowers after-meal glucose levels, according to a study published in the Annals of Nutrition and Metabolism in February 2010, which means you won't see rapid blood sugar spikes that trigger hunger. The effect is more pronounced when taken at mealtime as opposed to several hours before meals, write the authors. An earlier study also found that supplementing vinegar before meals prevents post-meal sugar spikes and that it helps you feel fuller after eating, which may help reduce calorie intake. The European Journal of Clinical Nutrition reported the study in its September 2005 issue. While supplementing vinegar before meals may boost weight loss, it's crucial to have realistic expectations. The Journal of Food Science published a review of the anti-obesity affects of vinegar in its May 2014 edition, and the results are modest. Authors found clinical data showing consuming vinegar led to a decreased intake of 200 to 275 calories per day. Over the course of one month, this daily reduction would lead to a weight loss of 1 to 1 1/2 pounds, which suggests supplementing vinegar is no magic bullet to shedding pounds, but it may have a subtle influence on weight loss. Small amounts of cider vinegar, such as the amount used in the Annals of Nutrition and Metabolism study, is unlikely to cause problems. Participants in the study reported no side affects. However, certain fad diets recommend higher amounts that may cause problems. The acidic content of vinegar may cause irritation to your throat and lining of your stomach. It may even erode your teach, warns a case study published in the Dutch Journal of Dentistry in December 2012. The report describes a 15-year-old girl who experienced tooth erosion from daily consumption of an entire glass of apple cider vinegar for weight loss purposes. In addition, avoid vinegar if you have gastroesophageal reflux disease, also called GERD, or any other condition affected by the acid content of your diet. Mainstream nutrition experts do not recommend vinegar supplementation as an effective or long-term weight loss strategy. Instead, emphasis is placed on other ways of enhancing weight loss, such as boosting your fiber consumption. Dietary fiber helps boost weight loss through various mechanisms, such as reducing glucose and cholesterol absorption, as well as increasing feelings of fullness after meals. The average American consumes less than the recommended amount of fiber as it is. Adequate intake is 25 and 38 grams for women and men under 50 years of age. Boosting your protein intake is another way to enhance weight loss. Compared to the conventional intake recommendation of 0.8 grams per kilogram of body weight, moderately boosting protein up to 1.3 grams significantly helps weight loss, according to a study. Participants followed a reduced-calorie diet that created a 500-calorie deficit, which is typical, and consumed protein-enriched meal replacements to boost protein intake. Participants following the high-protein diet lost significantly more body fat and overall weight than those following a conventional low-calorie diet.